Donate to the Flathead River Conservation Project and help conserve the natural beauty and heritage of Flathead River and Lake. 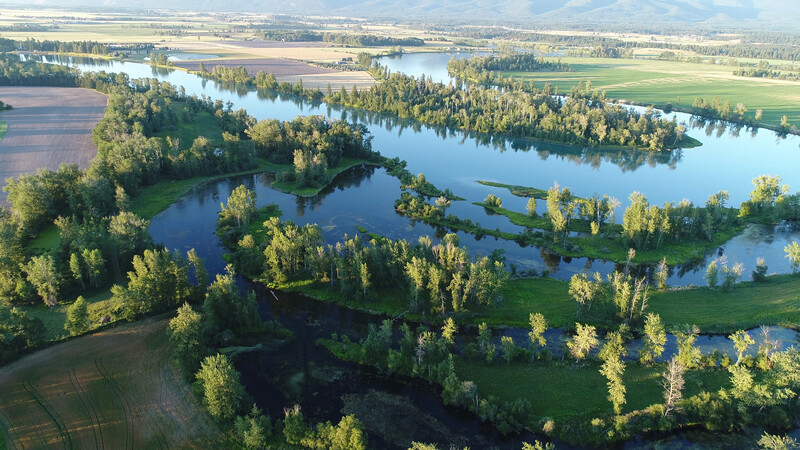 You can help seize an opportunity to conserve 155 acres of rich farmland and 33 acres of wetlands along the Flathead River. This exceptional land has wetlands and farm lands vital for birds, fish, clean water, and wildlife. Learn more about the Flathead River Conservation Project. Thank you for your interest and support! Flathead River to Lake Initiative partners work with interested landowners to conserve and restore our Flathead River and Lake natural heritage – excellent water quality, outstanding scenic and recreation values, abundant fish and wildlife, and prime farmland. Since 2000, partners have protected nearly 6,000 acres of critical lands, adding to a conservation network of nearly 12,000 acres of private and publicly protected lands. Learn more about the Flathead River to Lake Initiative. Checks can be written to the "River to Lake Conservation Fund" and sent to Flathead Lakers, PO BOX 70, Polson, MT 59860. For questions please call the Flathead Lakers at 406-883-1341 or Flathead Land Trust at 752-8293.